How to use Google Free Wi-Fi on Local Train Stations ? Last Year during the visit of Prime Minister Narendra Modi to USA, Google CEO, Sundar Pichai announced about the FREE WiFi to 400 Indian Railway Stations. 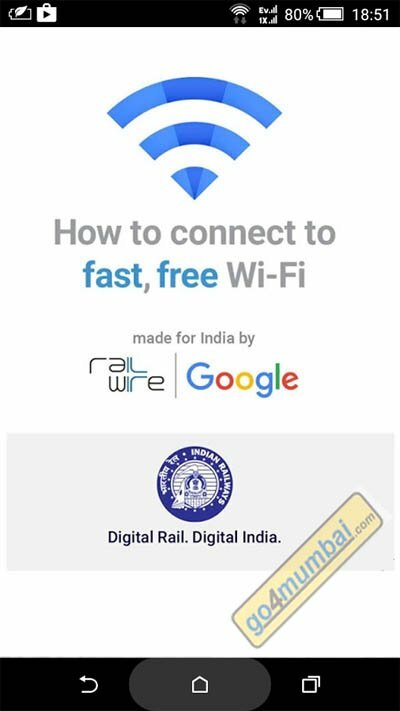 Free Wi-Fi service will be delivered in co-operation with Google & RailWire, Indian Railways entity. Google plans to cover more than 100 railway stations by the end of year 2016. First of such kind Free Wi-Fi service is offered at Mumbai Central, WR line station. Soon this will be rolled out to many more stations in coming days. There are no specific details on speed and performance of such connection, only that Commuters will get fast enough internet in the first hour to stream a High Definition Video. After one hour of usage, basic speed Internet will continue to work. First hour limit will avoid the misuse of this connection. Most of the people in India can not afford Hi Speed Internet even though many phones can connect to Wi-Fi these days. This service is going to give opportunity to common person in India to avail Fast FREE Wi-Fi on the stations using their mobile phone devices. Many travelling to office or home can go online and check mails, post updates on social website, Search some information, watch videos, do Whatsapp or anything that can be done online. There is full freedom to visit any website through Google Free Wi-Fi & not like Facebook Free Basics which restricts you to do everything through Facebook or partner websites. 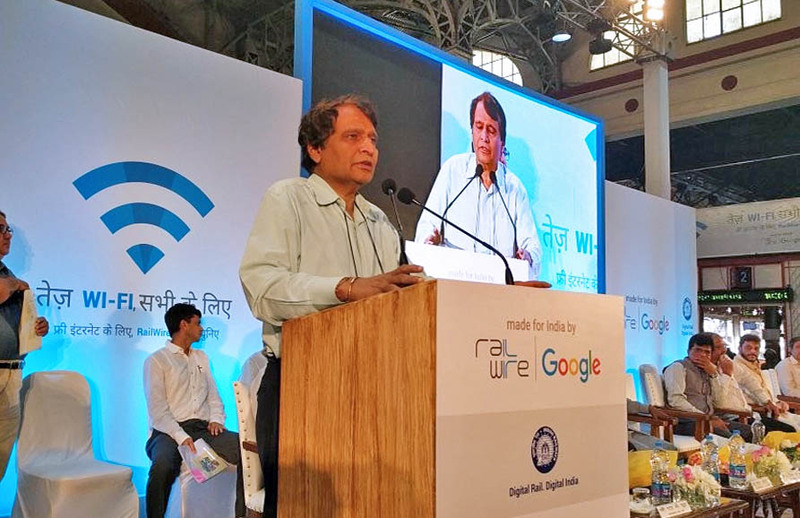 Railway Minister Suresh Prabhu launching free high-speed public Wi-Fi on 22-Jan-2015, Friday at Mumbai Central Station, WR. 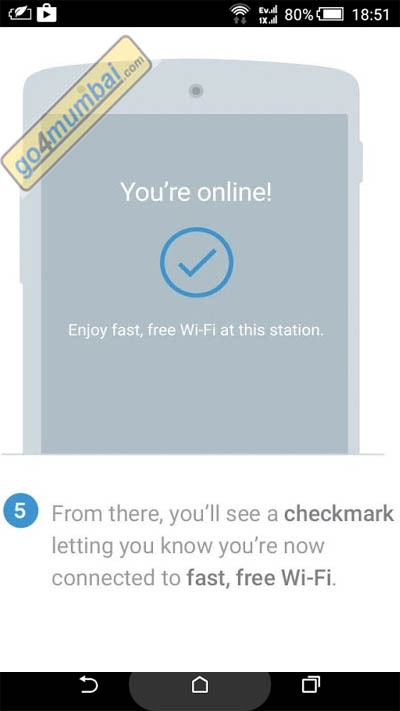 How to use Google Fast Free Wi-Fi on Local Train Stations ? Once you’re near Google Free Wi-Fi railway station, go to your mobile device Wi-Fi settings. 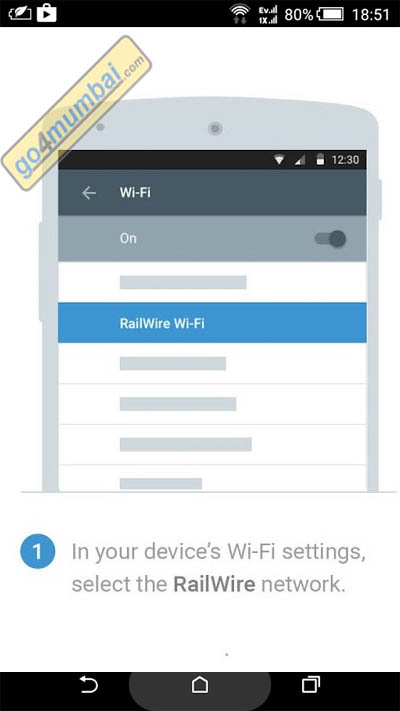 You’ll find a hotspot with the name as “RailWire Wi-Fi”. Select this. 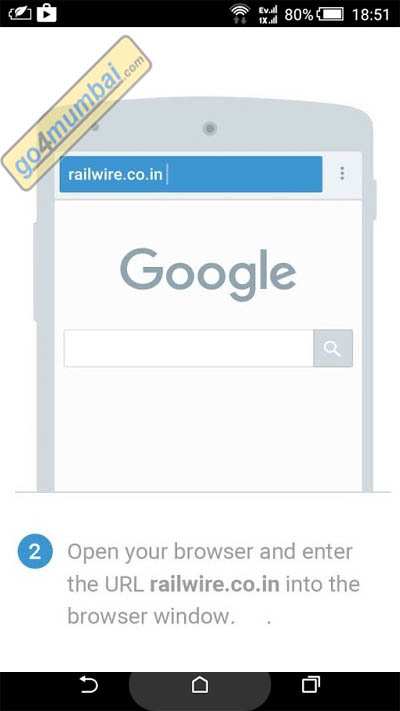 Once you’re connected to “RailWire Wi-Fi” hotspot open the browser and visit the url http://railwire.co.in. 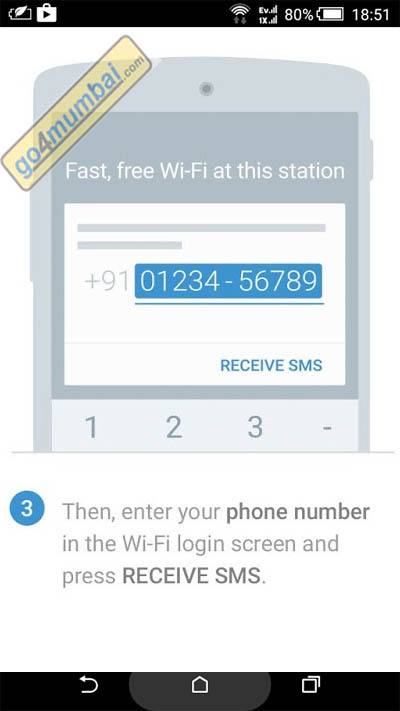 To access Fast, free Wi-Fi internet on the station enter your 10 digit mobile number and submit to receive your access code through SMS. Switch to Home screen to read your new SMS. 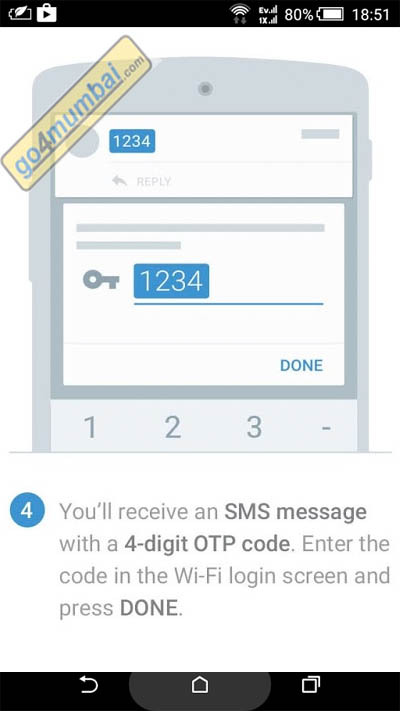 Switch back to browser and enter the 4 digit access code (OTP code). Press done. Once your OTP is verified, soon you’ll get the message “You’re Online!”. Now you can visit any website through browser or start any app which works with Internet like Facebook, Whatsapp, YouTube or Skype. Note: Google Wi-Fi Hotspot is built for wide coverage and lakhs of users unlike a typical Wi-Fi hotspot which offers connectivity in limited radius & bad experience. This Wi-Fi hotspot will work on both long distance train station & the local train station at Mumbai Central.